Every year, the winding roads of Haywood County draw thousands of motor touring enthusiasts in search of the area’s best scenic twists and turns. In fact, Haywood County is located in the heart of the greatest collection of motorcycle rides in the nation. Haywood’s central location serves as the perfect base to explore the area’s breathtaking scenery and still experience the homegrown hospitality of the NC Smokies. Maggie Valley is home to Wheels Through Time Museum, the world’s premier all-American motorcycle museum that houses over 300 of America’s rarest and most historic classic motorcycles. So what are you waiting for? Hitch up the steel horse and head for the NC Smokies! Before you kick off your adventure, stop by the Haywood County Visitor Center in Maggie Valley and pick up your free copy of the NC Smokies Motor Touring Guide. You’ll find tons of awesome rides to explore, but we’ve gone ahead included a few of our favorites in this itinerary! Soco Falls, located just a short walk off the main road, is a perfect way to start your scenic adventure. From Maggie Valley, head up U.S. 19 South to the Blue Ridge Parkway. Cross under the Parkway and continue downhill toward Cherokee. From the Parkway, it’s 1.5 miles to a marked pull-off on the left side of the road. There’s a small blue sign indicating Soco Falls 0.5 miles ahead. The trail begins at the break in the guardrail. The short, steep trail ends at a viewing deck overlooking the falls. 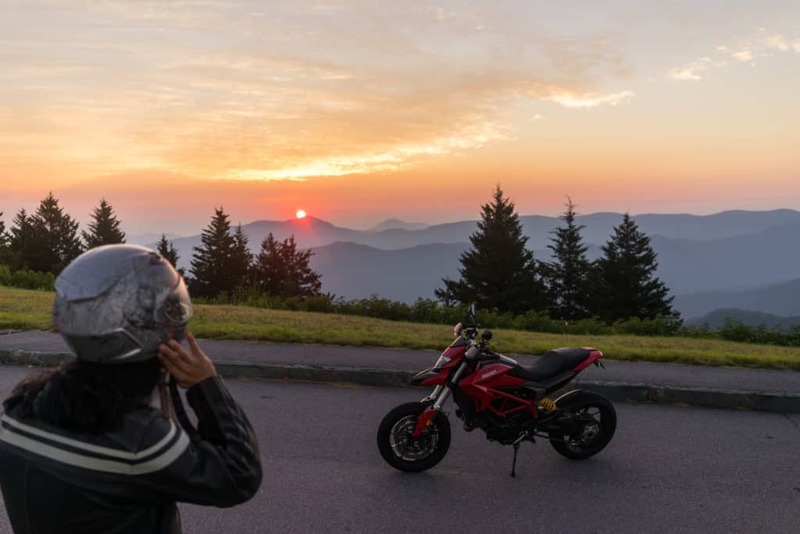 The 46 miles of twisting mountain roads that run through Haywood County make the Blue Ridge Parkway one of the most popular draws for motor touring enthusiasts. Hop on the parkway outside of Maggie Valley just off Hwy. 19 and head north toward Canton. This will take you on an exquisite drive through the Balsam Mountain Range, which is where Haywood County’s native bluegrass band, Balsam Range, got the inspiration for their name. Stop and stretch your legs at two of the most popular hiking areas, Graveyard Fields and Devil’s Courthouse, which are sure to inspire you as well! The Rattler has long been popular with locals and visitors alike. NC 209 takes you on a scenic and challenging ride north to Hot Springs. Extend your ride by continuing through Hot Springs on U.S. 25, pass through Marshall and follow Meadows Town Road to NC 63. NC 63 leads you back to NC 209, which will complete the loop. Its approximately 36 miles to Hot Springs and 98 miles will cover the entire loop ride. The Wheels Through Time Museum is home to a premier collection of rare American vintage motorcycles and other classic transportation displays. The museum houses over 300 of America’s rarest and most historic classic motorcycles, with over 24 marquees on display, including the likes of Harley-Davidson, Indian, Excelsior, Crocker, Henderson and much more. Any motor touring enthusiast could easily spend hours enjoying this intriguing collection! Conveniently located in the heart of the North Carolina Smokies, the Copperhead Loop offers a compelling mix of great scenery, challenging riding and easy access. Come see why the Copperhead is “Beauty With An Attitude!” A combination of Hwy. 276, Hwy. 215 and Hwy. 64 will provide you with a challenging ride on some of the most picturesque roads in Western North Carolina. Haywood County is the proud home of four microbreweries: Boojum Brewing, BearWaters Brewery, Frog Level Brewery, and Tipping Point Brewery andTavern. Each has its own distinct taste, so spend the evening sampling their various taps and rehashing your adventures in the NC Smokies! Many of the breweries even offer live music several nights throughout the week, so make sure you hang around to see who’s playing.